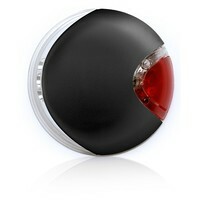 Flexi LED Lighting System is for use with the Flexi Classic, Flexi Classic or Flexi Neon Leads. Easy to attach with a Velcro tape system, the Flexi LED has a front white light and a red back light that can be turned on and off individually. With both these front and rear lights, the Flexi LED Lighting System illuminates the way in the dark and makes you clearly visible to other road users. Suitable for use with the Flexi Classic, Comfort and Neon Small, Medium and Large leads.